With 200+ sailboats on display just off the St. Clair River, the “Boat Night” party takes place before the “Port Huron to Mackinac” Race. 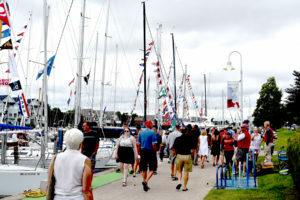 Located on the Black River near the mouth of Lake Huron is the annual 3-day Bluewater Festival celebrating this race event. During Friday night’s “Boat Night”, even with many beautiful huge sailboats rafted off along the waterfront the night before the race, the powerboats were as big a part of the constant entertainment for us to watch. Boats come from all over the great lakes for this event… even this power boat from Wisconsin! A quick view along the Black River as boats pass us by…. we look at them, and they look at us! New boutique hotel coming for 2017 in to the old Michigan National Bank along the Black River. Human “mannequin” contest … gets bigger every year! 1/2 Mile Long Boardwalk where over 200 sailboats are rafted off for the evening. The Bluewater Festival encompassed several blocks to walk downtown Port Huron … live bands performed in several areas, food trucks provided a quality variety of street food options, as well as stands from the several downtown eateries were on hand. Spectators walked comfortably along nearly a 1/2 mile boardwalk to watch the constant parade of power boats passing by. Port Huron is growing and has opened several new restaurants and shops over the past couple of years. And really needed is coming next year …. a new boutique hotel right on the Black River.